Hello my wine friends and happy #wineWednesday! What a great week it has been – I had B.C. VQA panel dates in Penticton, home for a day, then headed up to Campbell River, B.C. to spend time with family and then got to see my 4 ¾ year old graduate from St. Catherine’s Preschool…too adorable. Time seems to move far too quickly. While I was up in Penticton for panel, I stopped by Moraine Winery located just on the outskirts of Penticton as you head into Naramata. I like stopping into a winery I haven’t been to before when I am up in the Okanagan Valley and Moraine Winery did not disappoint. I had a wonderful time in the tasting room and was led through the entire selection by Toshie – who was most welcoming. There were a few standouts in the flight but, as I hadn’t reviewed a Viognier in a while, I chose one as my selection. 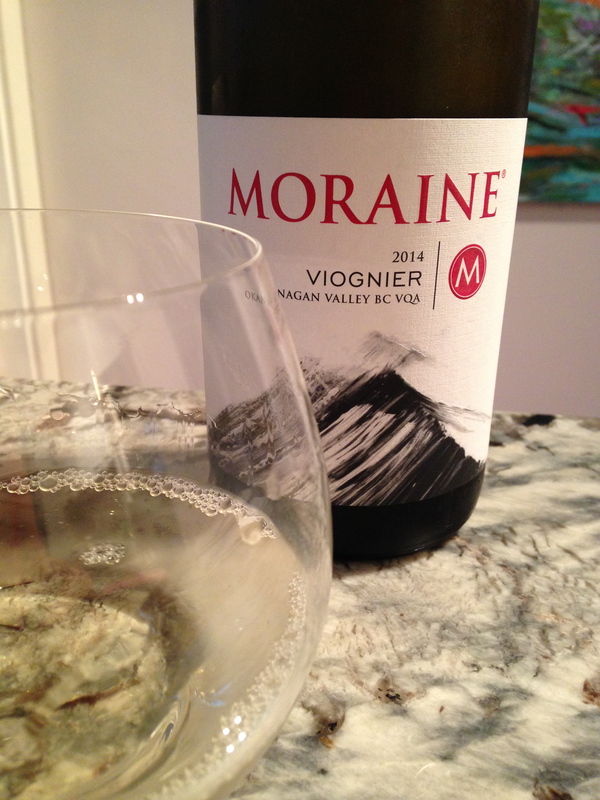 Viognier isn’t as well-known or appreciated as it should be, in my humble opinion. It is a grape that mainly hails from the Rhône region of France. It was almost extinct but is happily here to stay with many loyal followers. Moraine Winery’s winemaker, Jacqueline Kemp, knows what she is doing. This 2014 Viognier is ripe with lush melon and floral notes. In the glass, it is pale lemon in colour with aromas of cantaloupe melon, red grapefruit, honeysuckle with a whiff of pineapple. On the palate, there is a nice melon and floral component to the wine with some guava, honeydew and a sprinkling of minerality. The acidity is medium and it sits on the fence between dry and off-dry…there is a definite hint of sweetness here but it is that ‘ripe fruit’ sweetness that is incredible and delicious. It retails for $19 at the tasting room and comes in at 13.1% alcohol – so a great wine for under $20! This is a true winner and is a new favourite of mine. I want to pair it with a spicy Asian inspired dish and I know I will be in heaven. I couldn’t wait for the ‘dish’ and went ahead and enjoyed the bottle with my hubby. This is a knockout and is firmly planted in the ‘Hell Yes’ category. Next time you are up in Penticton/Naramata – be sure to drop into Moraine Winery and sample some excellent quality wines. That is it for me for this week. As always, I appreciate and welcome your comments – so thank you to all of you for your support! Gonna try some of that V tonight! Your blog has become my weekly ritual. I love you.